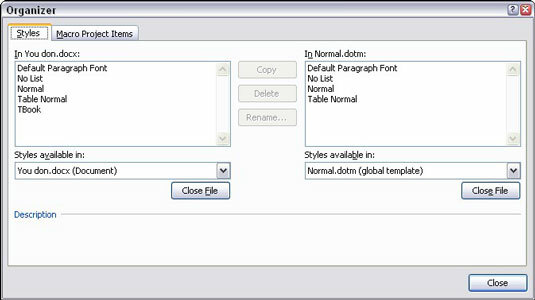 You can manage styles by swapping and sharing them between documents and templates using the Word 2007 Style Organizer. If you create a great style, it’s nice to use it in several documents. The Style Organizer lets you do this without re-creating the style (and even without using a document template). The purpose of the Organizer is to manage styles. The interface allows you to display styles for two different documents or templates — one on the left, and one on the right — so that you can easily swap and share styles between them. 1Summon the Styles task pane. To do this, press Ctrl+Shift+Alt+S. 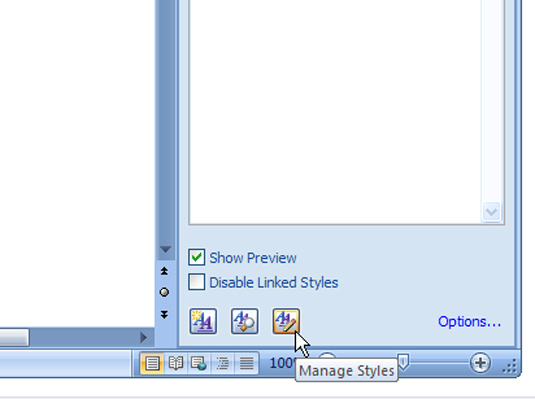 2Click the Manage Styles button in the task pane. The Manage Styles dialog box appears, but it’s not your final destination. 3Click the Import/Export button in the Manage Styles dialog box. The Organizer dialog box appears, with the Styles tab forward. 4Choose the style you want to copy. You can choose a style from either side of the dialog box. This copies the style to the other side. 6To choose another document or template, click the Close File button. That button changes to the Open File button, which you can then use to open any Word document or template stored on disk. After the document is open, a list of styles in that document is displayed in the window. 7Click the Close button when you’re done managing the styles. You’ll go out in style!